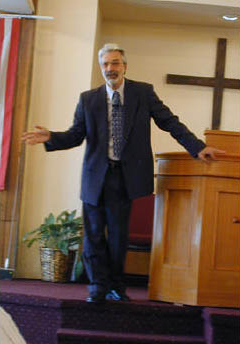 Pastor Vincent Fusco is the Executive Director of ACTS Community Development and the Lighthouse Mission. Rev. Fusco is an ordained minister. He graduated in 1964 with a B.A. from Pace College in NYC. In 1976 he became involved with a gospel church and began teaching and evangelizing with Catholic Charismatics. In 1982, with the encouragement of his pastor Dr. Benjamin Crandall and his son Douglas, Rev. Fusco founded the New Jerusalem Christian Church (now New Jerusalem City Church) in Gravesend, Brooklyn. Since then Pastor Vincent has conducted outreach to the needy and homeless in the greater Coney Island area and worked to combat racism and unite ministries across the city. He founded the Lighthouse Mission in Coney Island in 2002 and obtained permanent space for the Mission at our current location in 2004. Rev. Fusco and his wife Rev. Susan Mirti-Fusco continue to lead their congregation and advance their mission to help the poor in Brooklyn through the Lighthouse Mission, Rachel’s Joy Maternity Home, and the Mother & Baby Wellness Center. Denise Robbins began as a volunteer and continued to do so for over a year when she was asked to take over the staff position overseeing our after-school program. In addition, in late 2007 she became our Food Program Coordinator. She has been the senior staff member for our mission since then. She is responsible for the daily oversight of the mission’s activities, exercising authority when necessary, making decisions in the absence of the director, working directly with clients and overseeing food distributions. Denise also handles new client sign-ups. She does all this while raising a family of 4 as a recently widowed single parent. Paul Payne is one of our most important volunteers. He receives many early-morning food shipments at the Lighthouse and organizes clients during our busy food distribution hours three times a week. Ali King is one of our most trusted volunteers. He works with the food pantry clients and supervises the volunteers. Alma Leacock is our soup kitchen cook and her food is "off of the charts!" She is "famous" for her made from scratch Mac n' Cheese. Gary Brosman is the soup kitchen director. He also cooks for soup kitchen.